The information you are viewing for this event is from Thursday, Nov 22, 2018. Each year, on Thanksgiving morning, thousands of runners (and walkers) congregate in Saratoga Springs NY to race in the annual 5K Turkey Trot race, which benefits the Christopher Dailey Foundation. Register online at ZippyReg.com. Online registration closes at 12pm (noon) on Tuesday, November 20. Do not mail after November 15. Register in person between 4pm and 8pm Wednesday at the Saratoga Hilton Hotel. Either Wednesday, November 21, between 4pm and 8pm or Thursday morning, November 22, from 6am to 8am at the Saratoga Hilton Hotel. There is parking behind the hotel, which will fill up early. There are many streets to park on around the hotel, none of which will make for a long walk. Simply avoid the no parking signs. Do not park across from Olde Bryan Inn where the sign says "do not park past this sign". 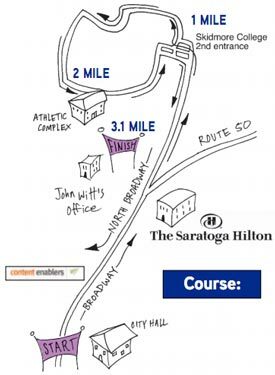 The Turkey Trot course starts on Broadway in Downtown Saratoga Springs, then continues into Skidmore's campus, and finishes on North Broadway. The Christopher Dailey Foundation is a non-profit, Saratoga Springs-based, charitable organization supporting youth sports in our community. After completion of the Christopher Dailey Youth Gym in Gavin Park, Wilton NY, the Foundation has continued to support youth sports in the Saratoga County area. Since 2012, the CDF has given over $500,000 to 50+ youth organizations.